Starting a game of Faeria for the first time is like starting any other card game: you face your foe head on, looking over your deck to see what you can play and what tactics might develop over the next few turns. Then you realise that there’s a chasm between you and your opponent, and so to actually play a card at all you’ll have to start building the board yourself. Building decks and planning card synergies your thing? Check out the best PC card games. The aim of the game is simple – whittle your opponent down to zero health by moving your cards to their orb and dealing damage to it. You’re limited to placing either two standard tiles, or one terrain tile – the former allows you to place normal cards, the latter are like resources that need to be accumulated before laying down more specific cards. For example, if you want to play a forest bear, you’ll need at least two forest tiles. 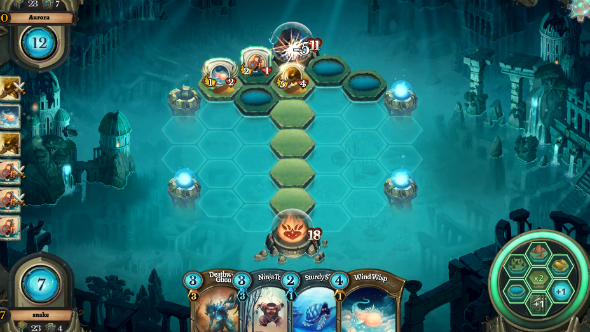 You’ll also need to consider the four Faeria wells positioned around the board’s edges. Like Hearthstone’s Mana Crystals the titular Faeria resource is essential for casting cards. 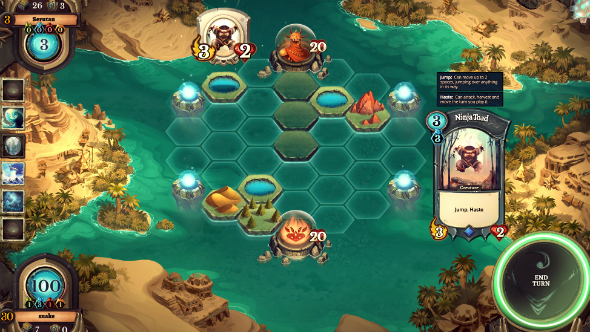 To gather Faeria, you have to place tiles and cards around any well you want to draw power from, making them like control points. By holding the majority of wells you open up more casting options for yourself, constraining your opponent in the process. 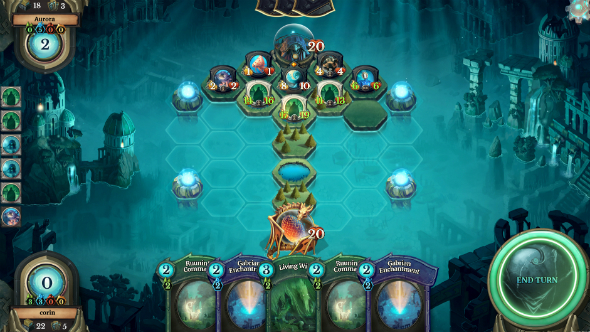 This means Faeria’s early game is more akin to the opening moments of a strategy game than a card game like Hex: Shards of Fate or Chronicle: Runescape Legends. The introduction of a board that you can make your own adds an element of tactility, and it means there are many more ways to dominate your opponent in Faeria than in most card games. Controlling Faeria wells will let you command the match through deploying the most cards, or more powerful cards. Similarly you can opt to charge straight at your opposite number, placing tiles around them so as to suffocate them and deal direct damage. There are ranged attacking options too, meaning you can set up a formidable defense and attack from deep in your own half of the board. This opens the game up to a broader range of tactics than we’re used to seeing in card games, and it’s easily one of Faeria’s greatest strengths. All that has a hefty impact on the questions that face a player at the start of each turn. What cards do I place? What order do I place them in order to maximise their effect? Where do I place them? Where should I place more land? And what type of land should I place? Making those decisions with a clear mind while a timer counts down on your turn is not exactly fun. However, watching your foe flounder as the same thing happens to them never gets old; doubly so when you’ve skillfully wrested control of the board and are watching them struggle against all hope to get a foothold in the match. It might add depth, but having to make five decisions before placing a single card creates its own problems. Stage fright is the main issue, especially for newcomers – there’s a lot going on at any one moment, which makes trying to calmly plan out a key move almost impossible. This is particularly frustrating as you enter the later stages of a match because of the sheer amount of options that are open to you at that point. This strategic width should feel empowering, but occasionally it’s downright stifling. This is only made worse by the size of the board and the general presentation of cards. A result of the card game-meets-strategy dynamic that Faeria has created for itself, placed cards appear like units in a game of Civilization. The effect that has is that you know it’s there, but you’re not entirely sure of what it does. If you know the game inside out, the small card icon and values might suffice, but when you’re trying to plan out your attack it’s nowhere near enough information to go on. You can mouse over each card to bring up its effects and enlarge it, but doing so creates yet another barrier between you finally making your move. To the credit of Faeria’s development team, their tutorial process does an impeccable job of introducing new players to all of the game’s systems and card mechanics. A sizeable chunk of Faeria’s single-player content is dedicated to familiarising players with the concepts behind the game before they’re thrown into the crucible of humiliation that is competitive PvP. Puzzle levels are a key part of showing players how to eke the most use out of their turn. These levels are set scenarios in which the player has a limited amount of resources, highly specific cards, often just a single turn and always the seemingly impossible task of defeating their opponent under such strict criteria. It’s a clever way of getting new players to think logically about how they play the game, which is no mean feat. Fortunately, Faeria’s approach to building and modifying decks is beautifully simple, even when compared to the genre’s more approachable games like Hearthstone. By playing through Faeria’s campaign mode you’ll unlock codexes, which when you’re starting out are the building blocks of your first decks. 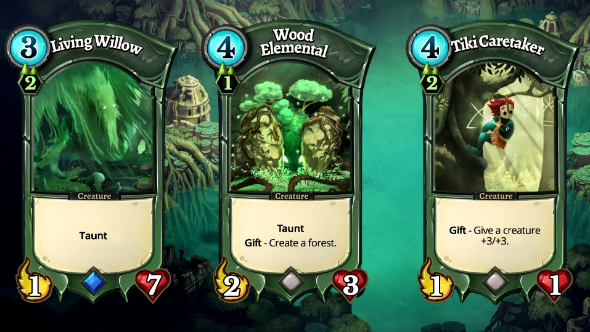 A codex is simply a collection of three cards that all synergise with one another particularly well – that means they have the same terrain type and offer the same property, like taunting a foe or producing Faeria. Each terrain type has four codexes, so if you have a rough idea of how you want to play you simply select the codexes you want until your deck of 30 cards is complete. If you want to tweak things further you can swap cards in and out freely as you would in any other CCG – but by choosing codexes first you’re forced to consider how exactly you want to play. It’s a seamless process that helps players get into the mindset of constructing a deck and then playing to that deck’s strengths. Systems like this are going to be essential, especially with Faeria soon to open its doors to an entirely new player base when it goes free-to-play on Steam on August 24th. The move will be Faeria’s make-or-break moment. Hopefully, its single-player and codex deck-building system will ease new players into what is a deep and occasionally brilliant card game. If you really can’t wait for Faeria to go free-to-play, you can buy it on Steam now, with a few Early Access exclusives for your trouble.